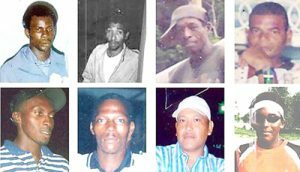 Retired Judge, Donald Trotman is pleased with the public response Commission of Inquiry (CoI) into the 2008 deaths of eight miners, whose burnt remains were discovered at mining camp at Lindo Creek, in the upper Berbice region. Trotman, who was sworn in as the sole Commissioner of the CoI on January 31, told Kaieteur News that during the past week, several interviews were conducted with key persons, setting the stage for a visit to the Lindo Creek soon. “We have been getting persons who have indicated their willingness to come forward. Persons have been very responsive since the commission was established. Over the past week, we have conducted several interviews as we prepare for the next phases of our work,” Trotman explained. He disclosed that public hearings could commence this week at the Public Service Ministry building, Waterloo Street. The Lindo Creek incident is one of several that occurred over a ten year span starting in the year 2002 known as the crime wave. Since President David Granger established the Lindo Creek CoI, there have been numerous criticisms. Among them is the Commission being political in nature, the timing and the decision to start with Lindo Creek as opposed to other incidents where there were multiple deaths during the crime wave period. Trotman said that he has observed some very adverse reponses about the CoI in the traditional and social media. “We are not fazed by it. We will press on. People must express themselves, except we do hope that they do so constructively. We are quietly having some positive responses. We are not concerned with the negative responses which have been appearing from time to time in the media,” Trotman stated. Previously, Trotman had told Kaieteur News that anyone that doubts the quality of work which will be produced from the CoI is welcomed to check his credentials, which show substantial experience in Guyana and the Caribbean region. The death of the miners sent shockwaves throughout Guyana during a period rocked by a spate of murders and robberies. DNA tests carried out on the remains found at the camp site confirmed the identity of the miners as Dax Arokium, Cedric Arokium, Compton Speirs, Horace Drakes, Clifton Wong, Lancelot Lee, Bonny Harry and Nigel Torres. It is the view of the Coalition Administration that the period of the murders between 2000 and 2010 “must be investigated so as to provide answers to grieving families, whose quest for justice has not been realised, despite the number of years that has passed. The Lindo Creek CoI is the first of many investigations which are likely to be undertaken by the government. The opposition People’s Progressive Party (PPP), which was in government during the crime wave period, has called for a single, comprehensive CoI as opposed to separate investigations. Initially, the PPP committed to participating in the CoI, promising to even testify at the hearings. With the establishment of this first CoI, the PPP is now wavering in its support, citing it as potential conflict of interest, as Justice Trotman is the father of Raphael Trotman, the Minister of Natural Resources and Leader of the coalition partner, Alliance For Change (AFC).